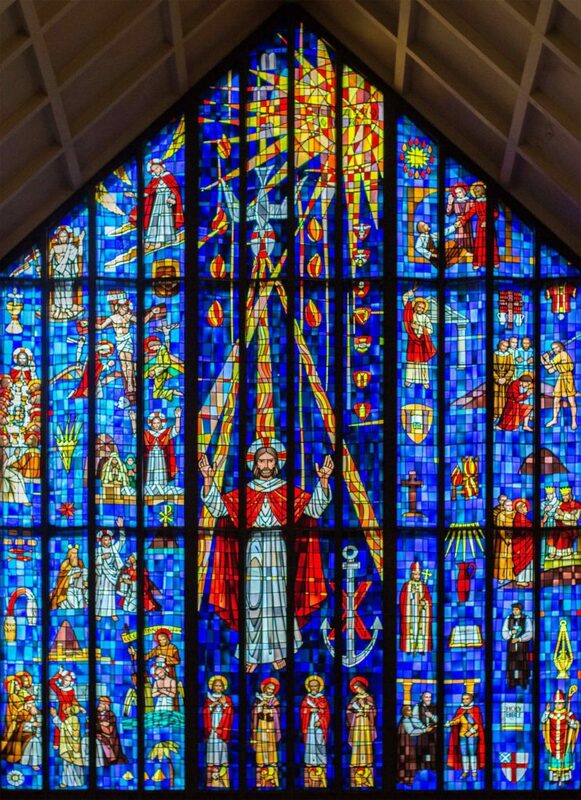 Also see Anglican-Hawaiian History and Sacred Art in Stained Glass. True to the nature of cathedrals throughout the world, the building of the Cathedral of Saint Andrew’s, Honolulu, spans from the laying of its cornerstone in 1867 to the completion of the existing “West” Window in September of 1958. A parish hall, administration/classroom building and chapel were also constructed during this same time frame. Planning for the cathedral edifice began in 1860 through the efforts of reigning Hawaiian Monarchs Kamehameha IV and Queen Emma, and was carried forward with the dedicated work of succeeding Monarchs, numerous Bishops (both Anglican, and then Episcopal), as well as Cathedral Deans and parishioners. The history of the cathedral close is intricately intertwined with the last 160 years of history in Hawaii. Intended from its inception to be the Bishop’s “seat,” the original ground was given by Kamehameha IV and Queen Emma. 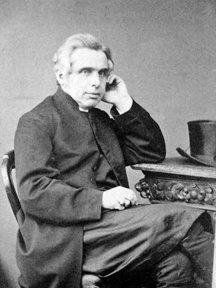 Arriving from London in 1862 as the first Bishop of Honolulu, Bishop Thomas Nettleship Staley brought with him plans for a structure to be built of coral and lava, similar to other existing church buildings in the Islands, complete with a tower for a peal of bells. However, during a trip to England in 1865, Queen Emma (then the Dowager Queen), raised six thousand pounds and selected architectural plans from the London firm of Carpenter and Slater for a “pointed” Gothic Cathedral. More aptly the plans described a “simple cathedral of modified 12th century French Gothic architecture”, as then favored by the Church of England, and intended to seat 600 to 800 people with spacious chancel, ambulatory and clerestory. Along with plans for the cathedral, Emma also purchased cut limestone arches, windows and pillars which were shipped to the Islands in 1867 as ballast; a second shipment was procured in 1882, as construction of the Cathedral building continued. The thick masonry walls used “beach” stone quarried from West Oahu, plastered to a smooth finish on the interior. Emma was present with her brother-in-law, then King Kamehameha V, and Bishop Staley to watch the laying of the Cathedral cornerstone in 1867, and the dedication of the Cathedral as a memorial to her late husband, King Kamehameha IV. Emma did not live to participate in the first service in the partially completed Chancel & Choir on December 25, 1886. Bishop Harry S. Kennedy, the fourth American Bishop of Honolulu consecrated the final two bays of the nave, the narthex and the Great West Window on Sept. 21, 1958, completing 91 years of work. The Cathedral Close today consists of three principal structures connected by cloisters or plazas. At the center is the Cathedral itself, constructed in the traditional form of an inverted ark, conforming roughly to the Biblical dimensions of Noah’s Ark per its original plans. Begun in 1865, the first phase was completed by 1886; increments based on its original design concept were completed in 1888 and 1908; the final increment, built to a design that bridges the original with the contemporary was completed in 1958. 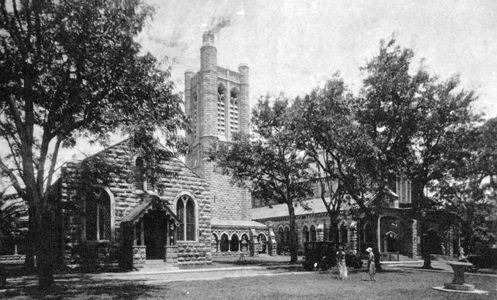 This last increment, by the California architect Carlton M. Winslow, includes the Narthex and Great West Window, and was constructed with cast stone carefully matched to the original masonry. The original wood roof structure, with an elaborate wood beamed ceiling, had to be replaced with steel and lightweight concrete in conjunction with the 1958 completion, at which time also a large organ chamber was added above the internal ambulatory adjacent to the Chancel. In 2002 a standing-seam copper cladding replaced asbestos tiles on the roof. Included as an integral part of the Cathedral, but visually appearing to stand alone, the Bell Tower was an independent project completed in 1911. Today, as then, the beauty of the building lies in its simplicity and well-executed details. Except for the over-sized bronze doors, the entire west end of the Cathedral is curtained with a brilliant wall of intricately patterned, hand-blown stained glass by the Wallis-Wiley Studio (California). Built with bronze-clad stainless steel vertical and horizontal supports, the window was one of the largest constructed in the late 1950’s in the United States. Entering though the unadorned bronze doors, and beneath bronze cast figures of Apostles, the spacious beauty of the Cathedral is apparent. The simple symmetry of the massive limestone columns and Gothic vaulting draw the eye to the open choir and chancel with its pierced stone apsidal screens and High Altar. Layered into the exterior wall behind the columns, a series of stained glass windows, most designed in England by Clayton and Bell prior to 1908, and completed by Wallis Studios in 1957, encircle the nave and ambulatory. Each its own historic and artistic treasure, these windows, as well as those in the clerestory above, add striking jewel-tone colors throughout the day. In contrast, the interior walls are plastered in a light coral tone finish which highlights both the limestone masonry and the stained glass. To complete the elegant simplicity, ambient lighting for the entire space is carefully provided by up-lighting the coffered ceiling and discreetly placed aisle down-lights. Versatile accent lighting is provided for the many functions of the chancel area. 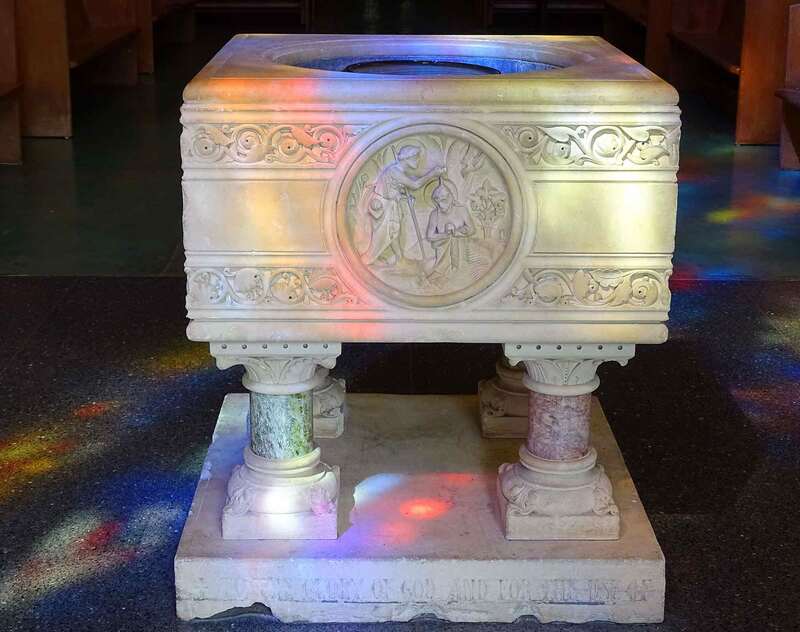 Other artistic treasures contained within the building are the font, High Altar, and pulpit — all carved of Caen-stone. The font is a gift of Lady Franklin, and was sent from England in 1862; the High Altar was executed by Evans & Company, Boston, 1908; and the pulpit, also by Evans & Company, was installed in 1913. Four Art Deco mosaic tablets, depicting various biblical scenes, have been placed in the Narthex vestibules. In this century, two devotional chapels have been introduced into existing nave aisle spaces. The Chapel of Patrons is dedicated to Saints Kamehameha IV and Queen Emma, its focal point being a contemporary icon of the Royal Saints created by Robert Lenz. The Peace Chapel, created in 2003 with its koa wood altar and intricate prayer desk, contains the “Crown of Thorns” by Rosalinda Kolb. Davies Hall, shortly after completion. To the left (north) of the Cathedral and connected by a stone cloister of Gothic arches, is Davies Hall, a large Parish Hall with adjacent service rooms, including a commercial kitchen. Completed in 1909, it was constructed of stone with various wood and steel elements, and includes a partial basement. 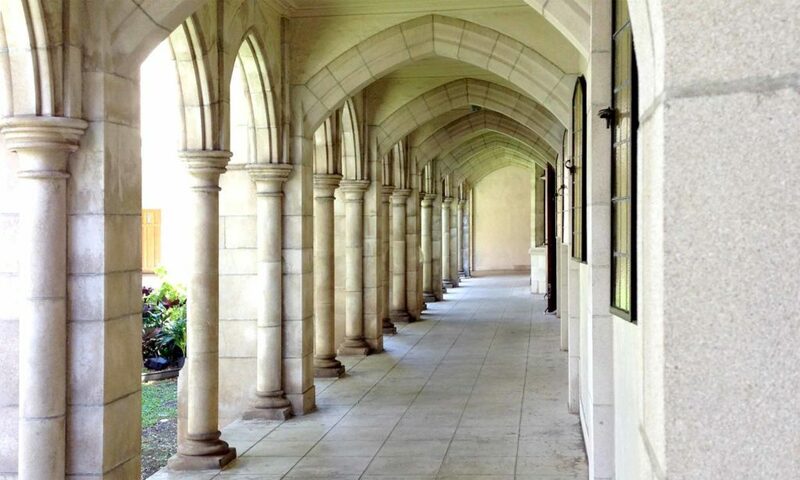 The Hall, a gift from a prominent Honolulu family, was designed by the same English architect as the original Cathedral building. Some 100 years later, the hall is currently being restored and renovated with an upgraded commercial kitchen and toilet rooms. The Brides Room, now of some romantic legend, is being relocated within the Hall to the Solarium, with new appointments. To the right side of the Cathedral, separated by a small plaza, is the Memorial Building. Built in 1929, it is a multipurpose structure which incorporates offices, conference rooms, choir rehearsal room, a large chapel (Parke Chapel), a full theatre (Tenney Theatre), and a smaller Parish Hall (the Von Holt room). Administrative spaces and the Von Holt room have been substantially renovated. The complex is constructed of concrete, brick, steel, with a wood roof structure clad in slate. A stone cloister partially wraps the façade, keeping the integrity of the Close appearance intact. Of special note are the still existing vaulted wood ceilings of Parke Chapel, as well as the chapel’s stained glass rose window and West Window by J&R Lamb Studio, New York City. The Cathedral Close grounds are bordered by a low stone wall enclosing lawns and set off by a number of various large trees. A plaza with fountain and sculpture of St. Andrew amidst dolphins leads from the city street to the Cathedral steps. There is significant space devoted to driveways and on-site parking. 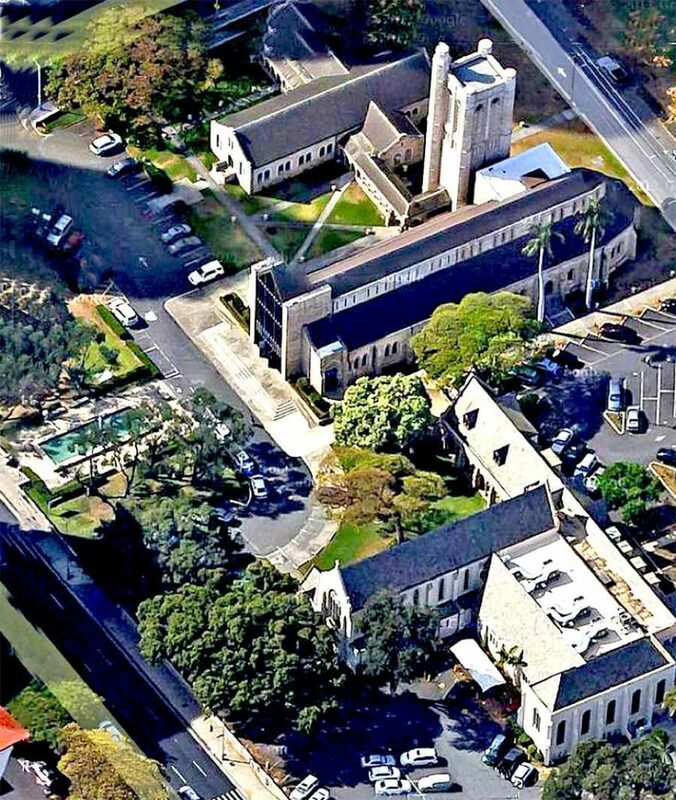 Bordering the business/commerce center of Honolulu, the Cathedral Close is immediate neighbors with Queen Emma Square; The St. Andrew’s Priory School for Girls (founded 1867); historic Washington Place, a Victorian edifice dating from 1847 and home to Queen Liliʻuokalani; and the iconic Hawaii state capitol building and grounds designed by J.C. Warneke and Associates (1969, San Francisco). 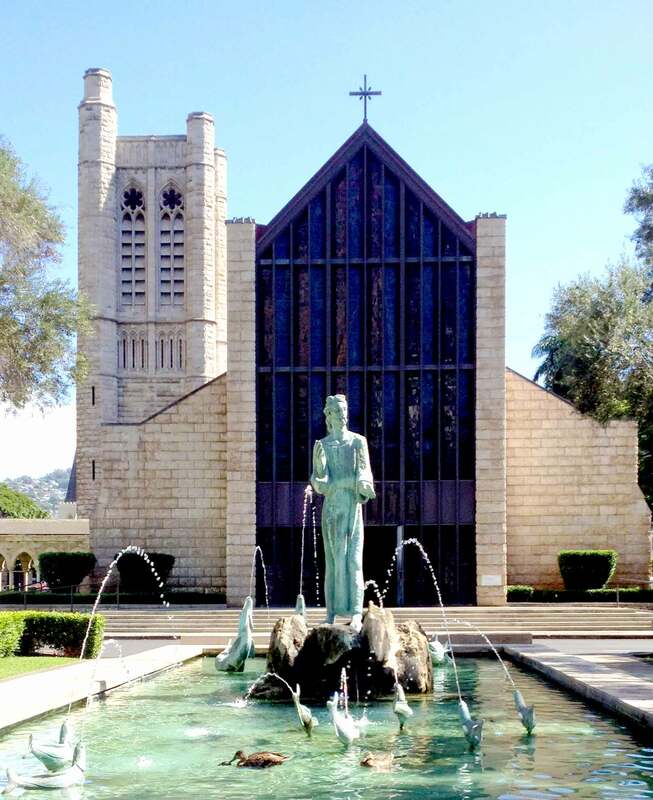 Fountain and front entrance of The Cathedral of St. Andrew in Honolulu, Hawaii.